I plan to get a new website up and running in the near future. In the meantime, all updates and news will be through my Facebook page and my YouTube Channel. It's been a busy few weeks, which is really cool. Other than finishing up my second album for Positivo Music, I've teamed up with the wonderful people at EpicMusicVn - which is really cool and crazy exciting! I finally got around to set up a Facebook page. My big masterplan (!!) is to commit to upload a new track every week (mondays) and hopefully attract some more subscribers by consistently adding new content. My first goal is 100 subscribers and once that's reached, an EP (with 4 or 5 tracks) will be available for download - totally free of charge. I'm currently doing the finishing touches on my second album (industry release) for Positivo Music. The album is currently called (working title) "Cinematic Romance" and here's the first released track. One of the short films I scored for BlackJack Production late last year is now lit, rendered and ready for the public :). I had a blast working on this and the film turned out really well I think! I just uploaded my first album "Dark Raid Original Score" to Bandcamp as a free download. Check it out here. You can also download the album directly from my site as MP3 here. 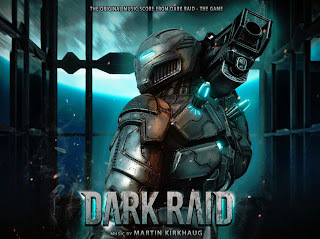 This album is the orginal score to the FPS game Dark Raid developed by Vector Games.